The following article is about octopuses. I love them because they’re such extraordinary thinkers. Their nervous system is so different to that of us vertebrates, yet they sometimes display extraordinary intelligence considering their molluscan heritage. Yes I know, how speciesist (or even orderist or whatever) of me. Now their article sets out by explaining why we care whether octopuses recognise their neighbours. They explain that recognising your neighbour is an important prerequisite in developing social behaviour such as dominance hierarchies. That makes sense. They then go on to explain that not all animals recognise each other in the same way. Some have a full type of recognition like we humans have, where they recognise other animals as individuals where others may only be able to class them into familiars and strangers or dominant or subordinate and so on. However, as they rightly point out, there may be a continuum, so maybe it’s not helpful to talk in such terms. The authors then go ahead to point out how wonderful octopuses are. They really lay it on thick. Now I want to stop studying sticklebacks and investigate octopus behaviour instead. Oh well. Apparently, despite this the social behaviour of octopuses isn’t well documented, and this is why they set out to investigate individual recognition in octopuses. I think this is a great thing to do and I can’t believe no one has done it before. Now there are good reasons to think that octopuses recognise each other. For one, they use colours to communicate and they people have noticed them forming dominance hierarchies in laboratories. Therefore, their hypothesis is that octopuses can recognise other individuals. 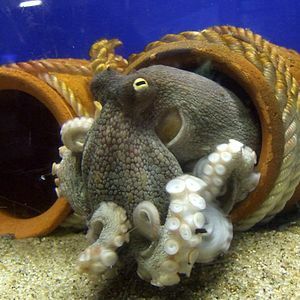 They tested this by basically making octopuses familiar with each other and recording the behaviour when those octopuses were paired either with a familiar octopus or a strange octopus. They recorded a variety of behaviours in the two interaction phases (2 and 3) and compared how they interacted with familiars and unfamiliars. They found that in phase two, where they allowed the octopuses to interact for 15 minutes per day, those that were housed in visual contact with each other behaved differently than those that were isolated. This indicates that there is some sort of visual recognition going on, although it could just be an artefact of being isolated and then suddenly seeing another octopus. In phase three where octopuses were either introduced to a familiar octopus or to a stranger, they found that the ones that were familiar with each other tended to avoid each other where unfamiliars interacted more. In the familiar group, the ones that had been allowed to see each other before, avoided each other more than those that hadn’t had any contact until phase two. There was no difference in interactions between unfamiliar octopuses regardless of whether they had been in visual contact with other octopuses in phase one. The results leave little doubt that this experiment has shown that Octopus vulgaris at least can recognise conspecifics and act accordingly. This, as the authors say, opens up a whole myriad of questions such as “Which signals are important?” and “How long do they recognise each other?” and “When will the tentacled overlords take over?”… ok maybe not that last one. – Hoo-boy, there comes Dave again. Better be off, or he might recognise me and next thing I know we’ll be shaking hands and there’s an entire day wasted and no mistake! Yeah. A lot of hands to shake. At least they’re not squid or cuttlefish. Then they’d really be in trouble.